Home » Does New Evidence Suggest There’s More To The Moon Than Initially Believed? While scientists have invested energy and resources into discovering life on planets like Mars, we have to ask ourselves why NASA stopped making trips to the moon. Could these photographs and theories point to extraterrestrial life being a lot closer than we think? Several strange structures have been spotted on the moon in new footage and photos. While it’s unknown what these structures actually are, many alien theorists claim that they could be home to aliens. According to UFO hunters, the object looks like a tank. There are many artificial objects on the Moon, but there is no reason for a modern day tank to be there. Or, is there? In March 2017, a disk-like object was spotted on the moon. The strange looking object might just be a mobile lunar base for aliens. If we exist, then surely aliens do too? According to UFO hunters, the disk-like object has been spotted in different places on the moon, suggesting that it’s moving around. However, things took a surprising turn when the disk-like object mysteriously disappeared days later. This suspicious looking object was also spotted on the moon’s surface. Many believe it to be an alien-built launch pad for their space crafts. Could aliens be on their way to Earth? In March 2017, even more structures were spotted on the moon from images taken by the NASA Lunar Reconnaissance Orbiter. The objects are disc-shaped and, according to reports, are part of the aliens’ lunar base which NASA is attempting to keep secret. The photos also featured what appeared to be a man-made crater that seems to be in the shape of a triangle. It’s unknown what the strange crater could be used as, but there’s no denying that aliens created it. According to reports, aliens allegedly live on the dark side of the moon in a super massive network of tunnels and caves and have managed to build huge underground cities. NASA has so far kept quiet about the new discoveries. It seems the organization never wanted the public to know. Could they be trying to hide something even more sinister? The underground cities are all part of a theory that claims the moon is hollow or that it’s filled with interior space such as cities or something even bigger. Some people have gone as far as claiming that the moon is completely artificial and may be some kind of starship, parked by an alien species thousands of years ago. 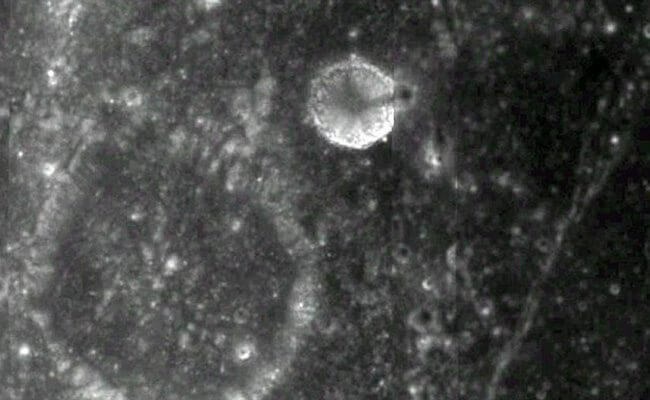 Other strange structures have been found on the moon such as the one seen above. It’s been reported that the strange structure could be the entrance to a secret tunnel leading to the supposed starship. According to UFO hunters, the theory that the moon is a ship is backed up by the craters because even the largest craters are shallow, suggesting that there may be some sort of impenetrable hull beneath the moon’s surface. Another note that suggests the moon isn’t what we think is that some moon rocks are shown to be older than those found on Earth, even though both the moon and Earth were formed during the same period. With aliens being already so close to home, could they have already visited Earth without us knowing? Several theories suggest that aliens are already living with us, disguised as ordinary people, or have previously visited us. Some theories date as far back as Ancient Egyptian times, with many claiming the pyramids were actually created by aliens among many other iconic landmarks. Many people have claimed that the Ancient Egyptians lacked the required tools to construct the pyramids which were perfect in size and shape. Along with this, many people have questioned how the Egyptians were able to carry large blocks and stack them to form pyramids. They wouldn’t have had the strength, so they must have had some technological help. According to conspiracy theorists, Egyptian hieroglyphics may suggest that aliens came from the stars, particularly the moon, and that they then visited Earth to educate them. However, UFO hunters have also found alien structures on other planets such as Mars. It seems the aliens may have visited other planets in our solar system. Conspiracy theorists claimed to have found evidence of aliens on Mars after the United Family of Anomaly Hunters, a group of UFO hunters, shared a YouTube video which featured an aerial view of the planet. The images, taken from the video, show what look like eroded domes with many claiming that they are actually walled cities located on the planet’s surface, built by aliens.